~ A good horse starts with a strong foundation. As a trainer, Dylan puts great emphasis in starting his horses with a good foundation. This creates a willing partner for the horse's future rider no matter the discipline. Through his experience handling a wide variety of horses and situations, he approaches everything with an open mind. Many horses that come to Dylan are to be started and develop the fundamentals necessary to turn that horse into the owner's ideal partner. Dylan has trained horses for basic trail riding, a finished cutter, or prepared them to go on to training in specialized fields such as dressage. He takes pride in his experience working with many young horses of many different breeds. When starting a young horse, Dylan will often use an older horse from which to do much of the preliminary ground work. This gets a young horse accustomed to seeing people above them. By riding another horse around them, they also tend to be more relaxed and naturally inquisitive. As he first starts riding a colt, he keeps things very basic. He encourages them to stand quietly, teaches them to follow their nose, and to move forward freely and easily. The primary goal is to make the horse confident and happy. Often, it is the first few rides in which a horse develops its opinions about being ridden and asked to do things. (In the words of Dave McGregor) "Just like people, if school is frustrating and confusing they don't want to go, but if they like their teacher and enjoy their tasks, they will look forward to going to school." Usually, it doesn't take long before a horse is comfortable and relaxed being ridden in any of the arenas, at this point the animal is ready to be ridden outside. Dylan has over a thousand acres of cattle land at his riding disposal, and he uses every inch of it. By taking young horses out, they get exposed to many new things. Out there they learn to balance their rider on a variety of terrain. This improves range of motion along with enhancing physical and mental development, which will suit them well when they return to the arena. When training any horse, it is important to keep in mind the needs and abilities of their owner, and adjust accordingly. Dylan encourages all of his clients to come out and take an active role in the training process. 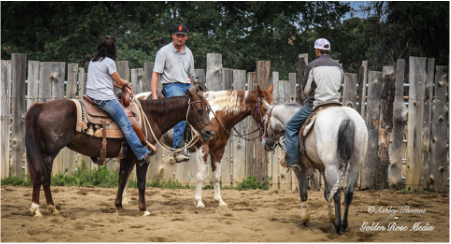 He encourages the owner to come out and learn how to handle their horse under his watchful tutelage. A young horse will be a young horse for a long time; by teaching both the horse and the rider, Dylan can help the owner develop the skills and tools that they will need to have a strong partnership with their horse for many years to come.